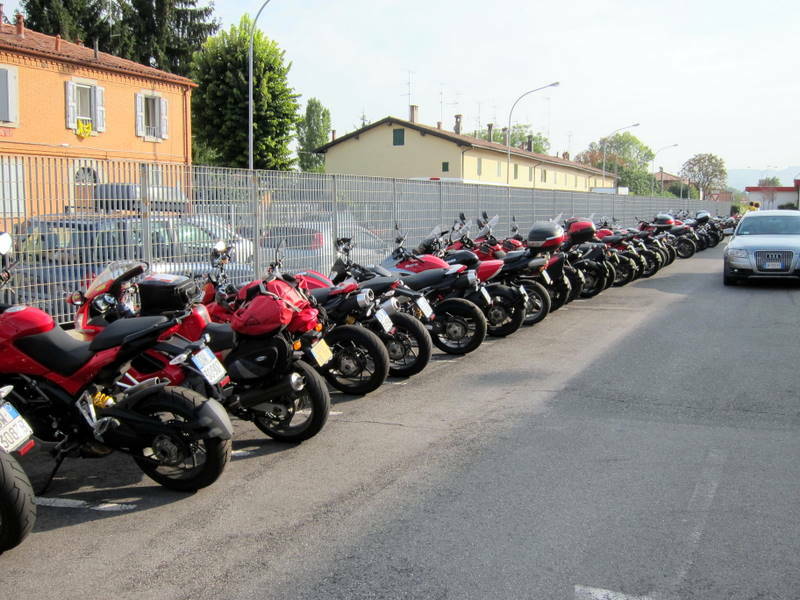 How could I go to Bologna and not visit Ducati? I had a Ducati many years ago and have quite a fondness for them. Not only that but the factory is in Borgo Panigali which is really a suburb but is officially part of Bologna. There is a bus that goes directly there – well, the stop is only 200 meters or so from the factory. In addition, Patrizia, in whose house I’m staying, knows Livio Lido, the director of the museum. I went with two other guys from the school one afternoon last week. Ducati actually started it’s existence in 1926 making parts for radios. At various times it also made radios, mechanical calculators and even electric razors. 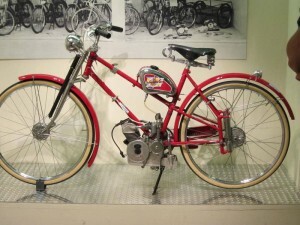 Just after WWII they started producing a small motor to add to bicycles and their first actual motorcycle was almost a bicycle with a 60 cc engine capable of 40 mph. It was dubbed the Cucciolo (puppy) due to it’s exhaust note. 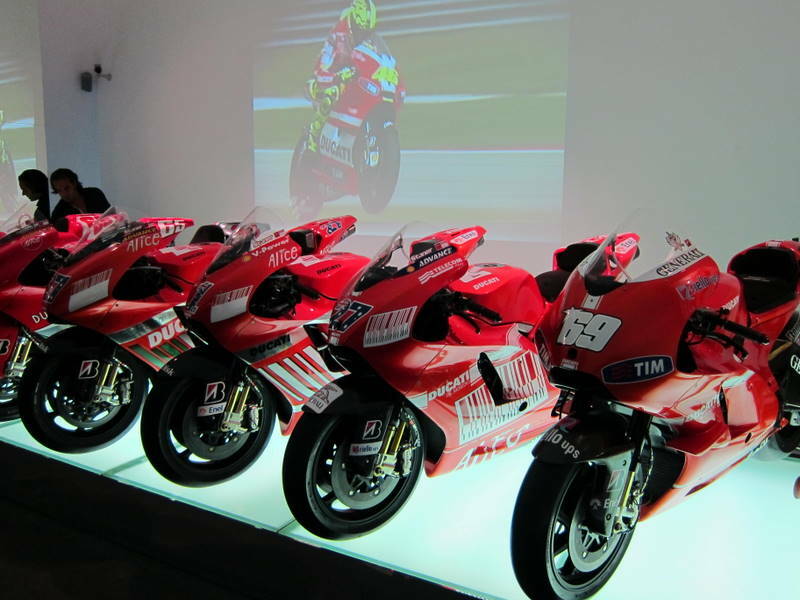 One thing led to another and now they are one of the best known motorcycle brands in the world probably because they devote 10% of their revenues to racing and do extremely well at it, having 13 world championships in the last 21 years. 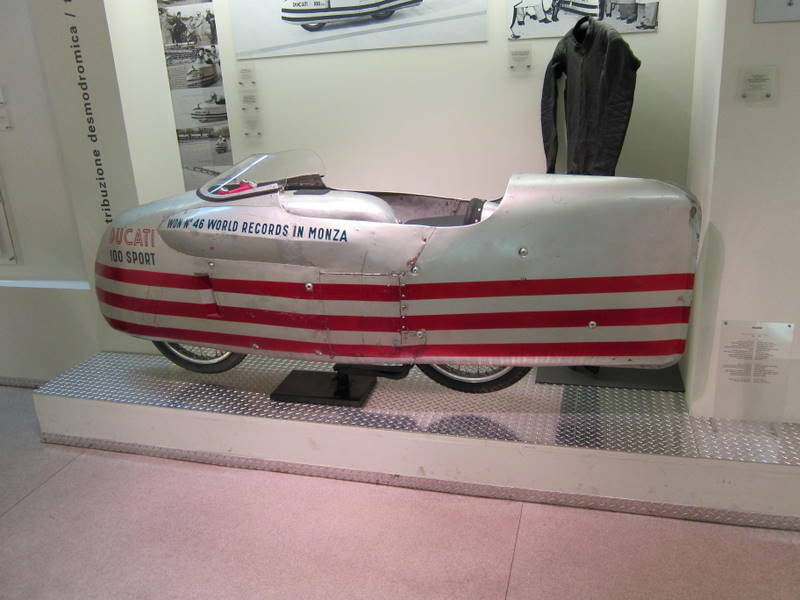 They also won an early land speed record on the curious vehicle shown below. A unique Ducati feature is the “desmodromic” valve system that uses cams to both open and close the valves. This allows them to both rev higher by eliminating “valve float” at higher RPMs and have higher power because they are never compressing valve springs. The downside, in my personal experience, is that it is virtually impossible for the owner to do a valve adjustment. It requires a well trained mechanic to do that and it is, of course, expensive. Another outstanding feature is their frame as you can see in the photo below in their top selling model, the Monster. It’s less expensive than the racier looking bikes and in general is more practical for everyday use. If I get another motorcycle (and I’m seriously thinking about it) it would be a Monster – used probably. The frame is really special. The tour was both of the factory and the museum. I found the factory fascinating. I’ve never been in a factory that produced mechanical stuff and found it really interesting – but of course I’m an engineer. 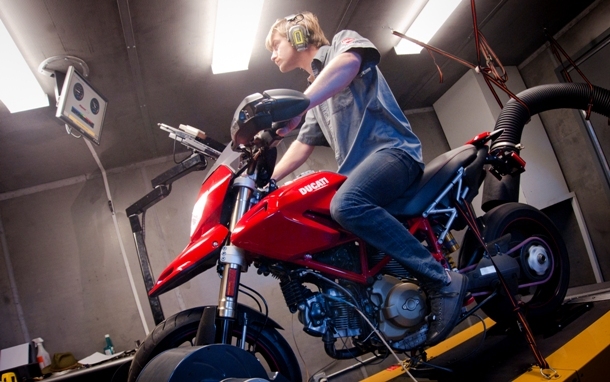 Every bike is tested on a dynamometer. One of the testers that we saw is a woman and the testers need to be master mechanics. The bike remains stationary with a rider aboard. The rear wheel is free to turn and they measure power at the rear wheel, test the brakes, etc. The dyno shows the speed (at least I’m pretty sure that’s what was said) and one was clocking 160 km/hr. which is almost exactly 100 mph. The tour was all in Italian and I understood a lot but not all. Natasha (a friend of Boris? ), our tour guide, also had excellent English to answer questions when I got lost. We saw the area where purchased parts were machined to their final specs, motors in various stages of assembly and various models of bikes in final assembly and test. Unfortunately we were not allowed to take photos due to some proprietary techniques used there. In the museum there were, of course all kinds of motorcycles from the start to the latest superbikes which have 4 cylinders with 16 valves and produce over 160 hp. That’s almost as much as my Audi A4 but they weigh only 380 pounds – a rocket for sure. 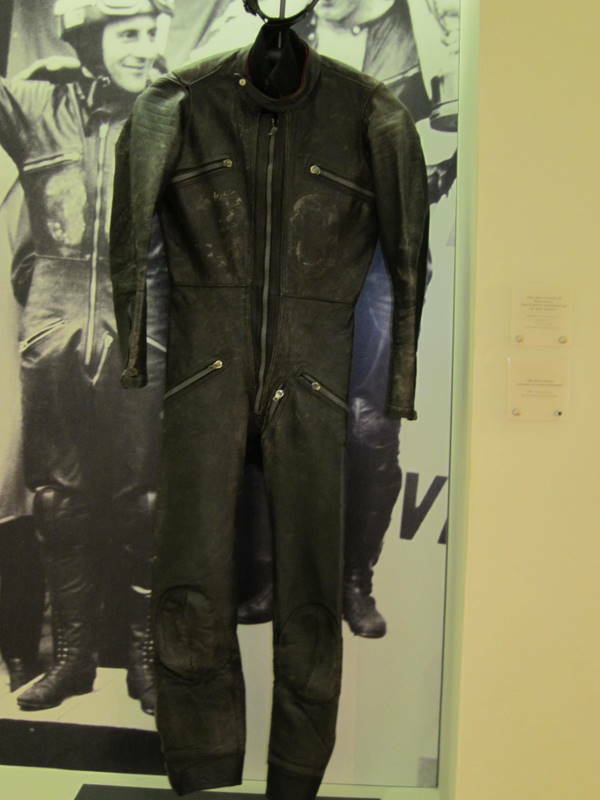 The among the highlights of the tour were a riding suit with a special zipper as shown in detail in one of the photos. We were asked to guess the utility of this zipper. 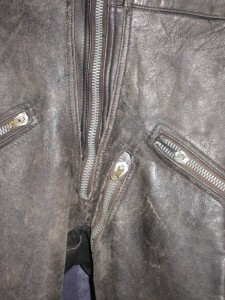 Well, consider that in a really long race the rider has certain needs – that’s the purpose of this zipper. Sounds pretty scary to me. 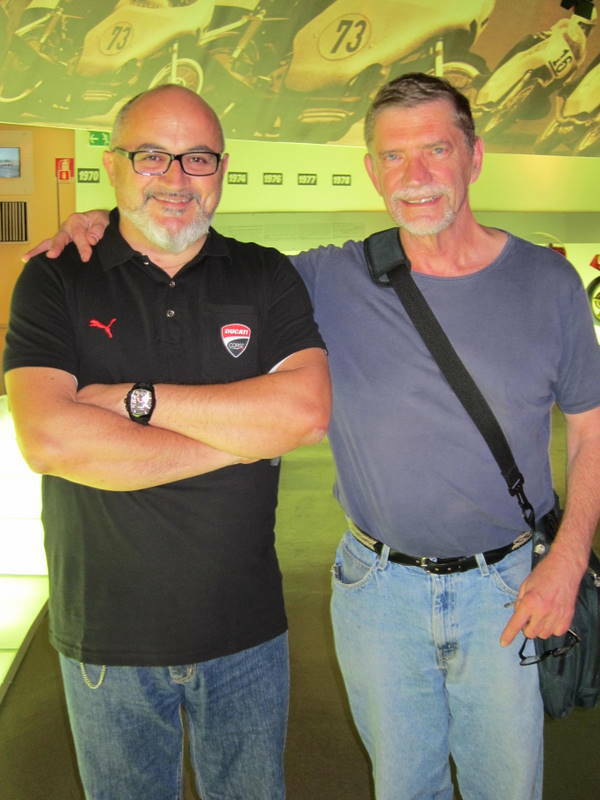 Another highlight was the conversation with Livio. While I wanted to try my Italian, his English is excellent. 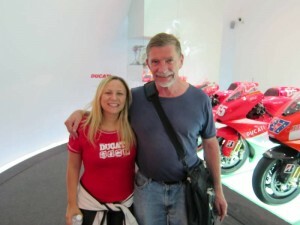 He has been interviewed by the New York Times (click here for the link) and I found a video of him discussing Ducati history (click for here for that link). In the end, it is always the people that make the experience special. Natasha and Livio were great. 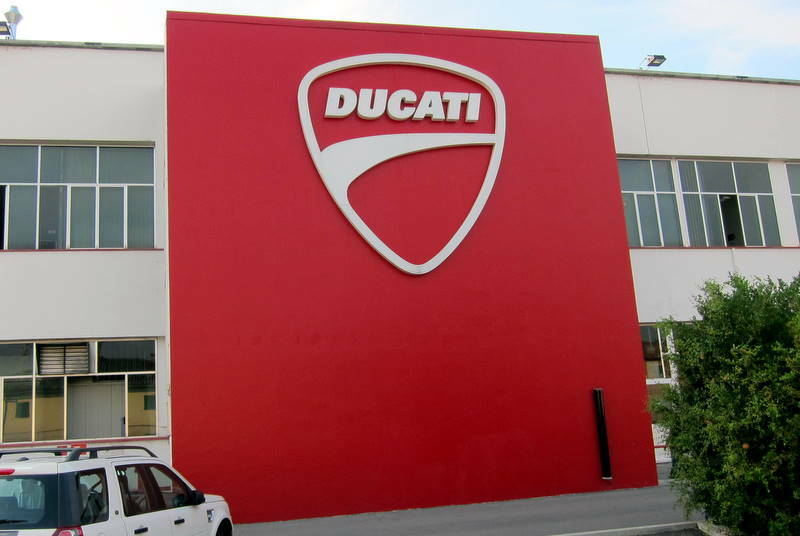 BTW there is a parking area in front of the factory for motorcycles but you can only park your bike there if it is a Ducati, otherwise you are relegated to a distant parking area. 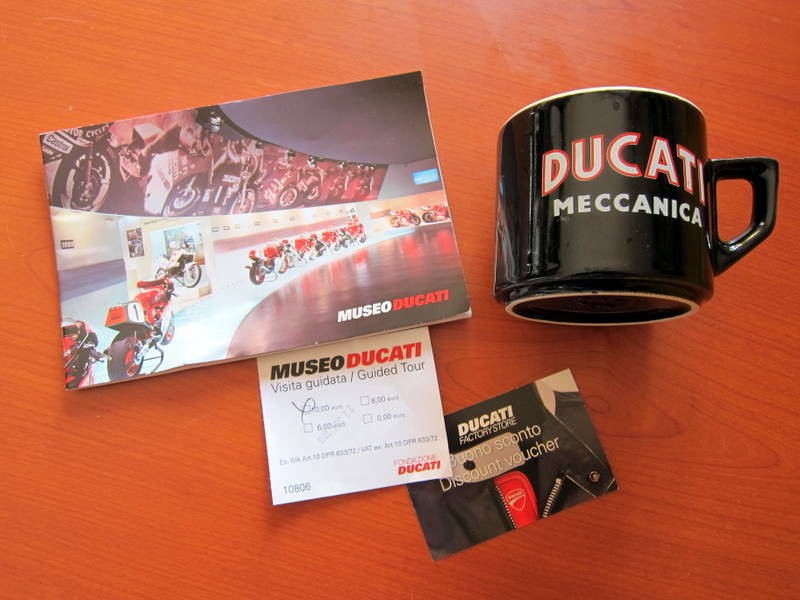 Of course if you work for Ducati you receive a 30% discount on a Ducati. Hmmm, maybe I can get a job there. And of course I came away with a souvenir from the factory store that I can use every day. You’ll have to click on the photo to see get a better view of the cup. 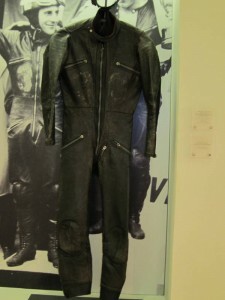 This entry was posted on Thursday, September 29th, 2011 at 9:01 am	and is filed under Travel, Vehicles. You can follow any responses to this entry through the RSS 2.0 feed. You can leave a response, or trackback from your own site. Ahhh… I see you are using your time wisely! 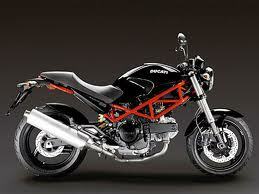 And The Monster looks just right… bellissimo! Yes the Monster is probably perfect but now I’m starting to think ” Use the money to buy the motorcycle or use it to come back to Italy for another couple of months?” Tough choice but I’d probably opt for Italy. We’ll see.